Being a college student can be pretty hard as it is and maintaining a budget while being in school can add twice the amount of pressure. At this age, we are expected to balance so many responsibilities and manage “being an adult” all at once. For some, this may seem easy, but for others (like myself) it’s actually a lot harder than you think. Since I’m in college full time and only work a part time job, I don’t have much money to freely spend on myself or on other people. Luckily, I have some incredible ways that meet your budget friendly lifestyle and bring out your inner Pinterest side. Some people may jump right to the conclusion and say “Oh, I’m not crafty, I can’t do that.” Well, trust me you can! A very surprising amount of simple crafts are out there that you can create for a gift to a loved one or to decorate your home with. You may not know it, but there are multiple Do It Yourself (DIY) crafts that ANYONE can do to for a time savvy Christmas gift. It’s as easy as 1, 2, 3 and you can save so much money (two things that college students LOVE)! Did I get your attention yet? Well keep reading, it gets even better! Think of it this way, it’s the week of Christmas and you need to decorate your new home for the holidays. You are all cozy in your fuzzy slippers and pjs when you suddenly realize…you’re the host of the party. What do you do now? You have already spent so much money on Christmas gifts for everyone and don’t have enough money to hurry out and get decorations. Don’t fret, this is where your crafty side comes in handy. Here is one super easy idea you can use to decorate your home for the holidays. First, you are going to want to get a hold of some pine cones. Fake pine cones can be found at any craft store near you (or online) for around $6.00 for a package of about 8. 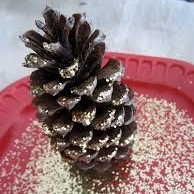 Next, you are going to grab some Elmer’s glue and glitter (for a total of nearly $3.00) and put the glue wherever you please on this pine cone and sprinkle some glitter on it. Then, all you will need is some jute. Jute is basically just a tan, tough, ropey form of string (also known as twine). It’s usually used in rustic settings like for a wedding or cabin craft. You can get 200 feet of jute for only $2.00 online or at a craft store. Now thats a steal! Now that we have our pine cones dried and ready to go, we can continue onto the next step: tying them up. All you have to do is cut and tie the jute to the pine cones and you’re good to go. Once this is done, you can hang up your pine cone garland and sit right back down to finish your hot chocolate. This little DIY project will cost you about $11.00 max which isn’t a lot for someone who is looking to decorate their home, year after year or to give to a loved one as a gift for them to use in their home as well. Refer to the last page for step by step images to help guide you! Keep the good ideas flowing because here is one more super easy craft you can create. The next craft we are going to make is called framed ornaments. Head on over to the nearest store near you and pick up any size picture frame that you want. The prices range depending on the size and style, so keep that in mind. Once you are at the store you are going to pick out the most unique picture frame that you can find, whether it’s a cool deign or neat color, you can choose whatever you like! Once you have your frame you are going to need some ribbon ($6.00 for 50 yards), ribbon can be found at Walmart or other related stores. You are going to want to pick two different types of ribbon for this one, any color, design, or thickness will do. Like I said before, it’s all up to you. After you have these items, you will then purchase three (or more depending on the size of your picture frame) different Christmas ornaments (a single bulb can be purchased for 78 cents online or in store). An average total for this one DIY project will only add up to $12.00, how fantastic is that? Now that you have everything, you can go back home and begin your project. So, lets begin! Take out your hot glue gun making sure it nice and hot before you begin. Take out your picture frame and your ribbon, then tie the ribbon in a beautiful bow, and then glue it down to the top of the picture frame. Be very careful of your fingers so you don’t burn yourself on your hot glue gun. After you glue the ribbon, you are going to remove the glass and carboard back of the frame. Tie the other ribbon onto the three bulbs and glue that to the back of the frame, so the bulbs are hanging down in the center of the frame. Once this is done you are going to find a nice place to set your frame down where everyone can see what you created! Refer to the last page for step by step images to help guide you! Don’t be ashamed to be on a budget, and be excited that you found your crafty side! These crafts would only cost you about $23.00 total, which again is not a lot for decorations that can be used over and over again. Stay creative!